A scapula fracture is an uncommon injury. The scapula, or shoulder blade, is a wide, flat bone that sits behind the rib cage. The scapula connects to the clavicle (collar bone) in the front of the body, and to the humerus (arm bone) at the side. Part of the scapula is lined with cartilage (the glenoid) and forms the socket of the ball-and-socket shoulder joint. 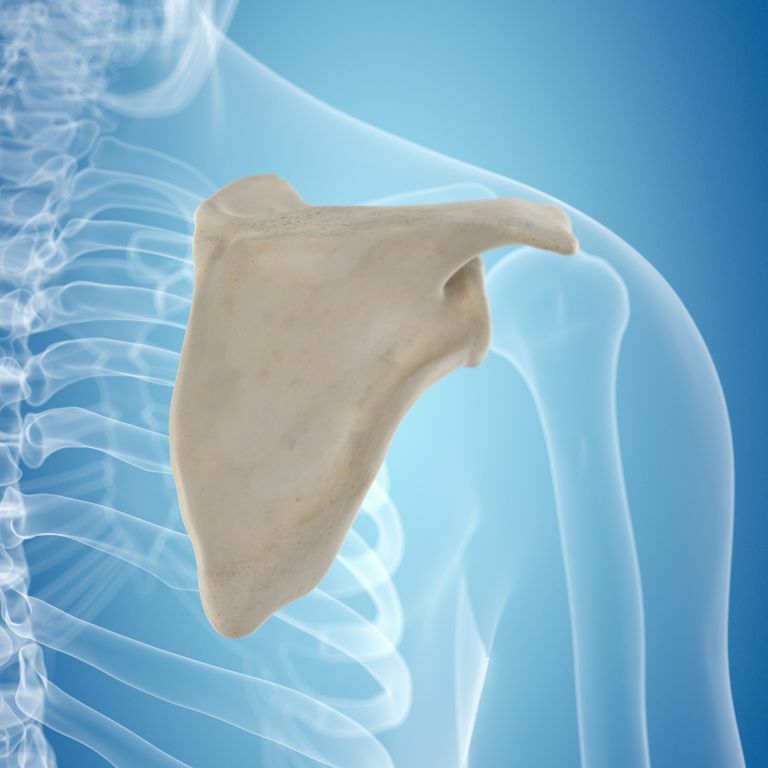 Scapular fractures are rare injuries that generally occur with significant, high-energy traumatic injuries such as motor vehicle collisions or falls from a height. When a scapular fracture does occur, doctors need to look carefully for the occurrence of other chest injuries. Because of the energy necessary to cause a scapular fracture, it is common for there to be other types of chest injuries including pulmonary contusions, rib fractures, and pneumothorax. Scapular body fractures are the most common type of scapula fracture. These injuries seldom require any specific treatment more than a simple arm sling. The important fact is that scapular body fractures are commonly (80-90%) associated with other injuries such as lung and chest injuries. Scapular neck fractures occur just adjacent to the glenoid--part of the shoulder joint. Again, most of these fractures can be treated without surgery unless there is significant angulation of the broken bones. In these cases, the shoulder joint can be affected if surgery is not done to realign the bones. Glenoid fractures involve the cartilage surfaces of the shoulder joint. These fractures require surgery when the should joint becomes unstable or if the fragments are far out of alignment. Patients with glenoid fractures are at risk of developing shoulder arthritis. Common signs of a scapular fracture may include tenderness over the back of the shoulder and upper back, difficulty lifting the arm moving the shoulder, and pain when taking a deep breath. There may be swelling in the area of the shoulder blade, and over time bruising be also developed in this area. Many scapular fractures can be evaluated with regular x-rays. X-rays may show signs of damage to the bone of the scapula, and we may also show evidence of damage to the lungs. In many situations, additional imaging tests may be necessary to further evaluate both the scapula and lungs. The most commonly performed test to further evaluate is called a CT scan. There is great variability in treatment of scapular fractures. Surgery is often recommended for glenoid fractures because of the effects on the shoulder joint. However, there is significant variability on the treatment of scapular body fractures. While there are many published guidelines, these don't always agree, and most authors agree that individual patient characteristics often play a role in determining the best treatment. If you have sustained a scapular fracture, you will need to be evaluated by orthopedic surgeon. Often orthopedic surgeons that specialized in either shoulder surgery or trauma surgery will help to manage complex scapular injuries. Your surgeon will review imaging studies and examining her shoulder to determine if surgical treatment is needed. Scapular fractures or uncommon injuries that are often associated with high energy trauma. Because of the location of the shoulder blade, injuries to the lung should always be evaluated when the patient has sustained a scapular fracture. The ideal treatment of a scapular fracture depends on a number of characteristics. While no scapular fractures can be managed without surgical treatment, there are reasons why a scapular fracture may require surgery and the scapular fracture should be evaluated by an orthopedic surgeon to determine optimal treatment plan. Cole PA, et al. "Management of Scapular Fractures" J Am Acad Orthop Surg March 2012 vol. 20 no. 3 130-141.